Mumbai, also known as London on Acid, is the commercial and cultural capital of India. It blends every state in India and every country in the world. And with an official population of 18.9 million people, you can find just about anything. I arrived in Mumbai by train from Hyderabad at 4:30 am in Lokmanya Tilak Train Station, 15 km away from the city center. Because of the 24 hours hotel check-in policy, I wanted to stall until about 9 before checking in. The train station and its surroundings might have been the saddest place I have ever seen in India. Beggars, mostly women and young children approached me asking for money. Stray dogs were everywhere and there was a small slum of dilapidated shacks built in the middle of mountains of dirt. Those not fortunate enough be able to live in the corrugated steel slum buildings were huddled around makeshift stoves cooking breakfast or sleeping on the pavement. The whole place smelled like human waste because it was too expensive to pay the 5 cent fee to use the train station bathrooms. As the sky got light, I walked away from the railway station towards the suburban rail station just across the river of putrid water. I bought the train ticket and hopped onto the open air train- wall to wall with people headed to work in the city. 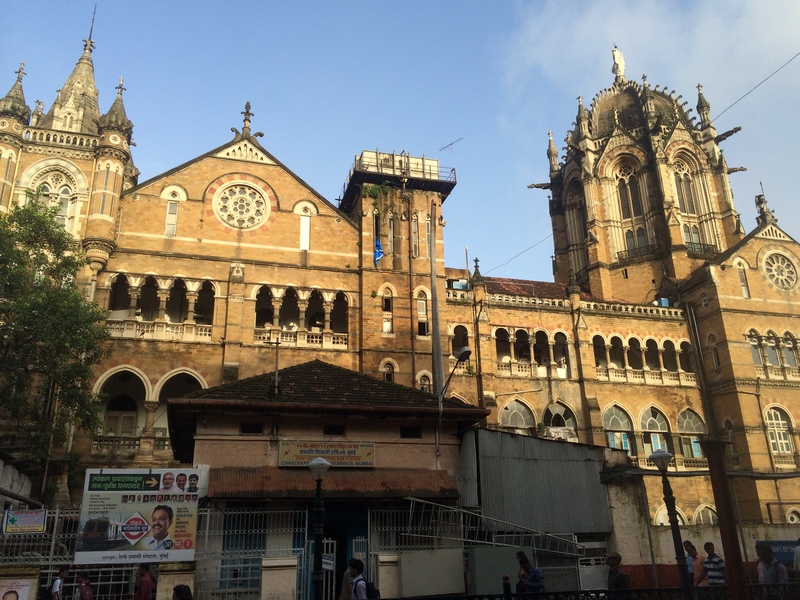 20 minutes later, I was at Victoria Terminus in the Churchgate neighborhood of Bombay. As I walked outside, the landscape suddenly shifted. All the buildings were British colonial, there were no rickshaws (only British-looking cabs), but most noticably there was no honking! While I have never been to London, it looked just like it in the movies. Victoria Terminus, like many of the colonial buildings and the city itself, was renamed in 1996. The new name was Chhatrapati Shivaji Terminus. In 2004, the building was declared a UNESCO World Heritage Site and was reported to be Asia’s busiest train station although there was no data to prove it. Coming from other Indian cities, Mumbai actually seemed peaceful. The 2.5 km walk from the train station to Colaba, the main tourist district, was lined almost exclusively with British colonial buildings including the Bombay Stock Exchange, the Bombay High Court, the Prince of Wales Museum (also recently renamed after Chhatrapati Shivaji), St. Thomas Cathedral, and the Gateway of India (built to commemorate the visit of King George V). The old buildings housed mostly government offices and Western businesses such as Citibank and Starbucks. The only noticable difference from London (or what I imagine London to be) is that there were dozens of homeless people sleeping in front of every building. I ended up getting breakfast at Le Pain Quotidien, which had free wifi. 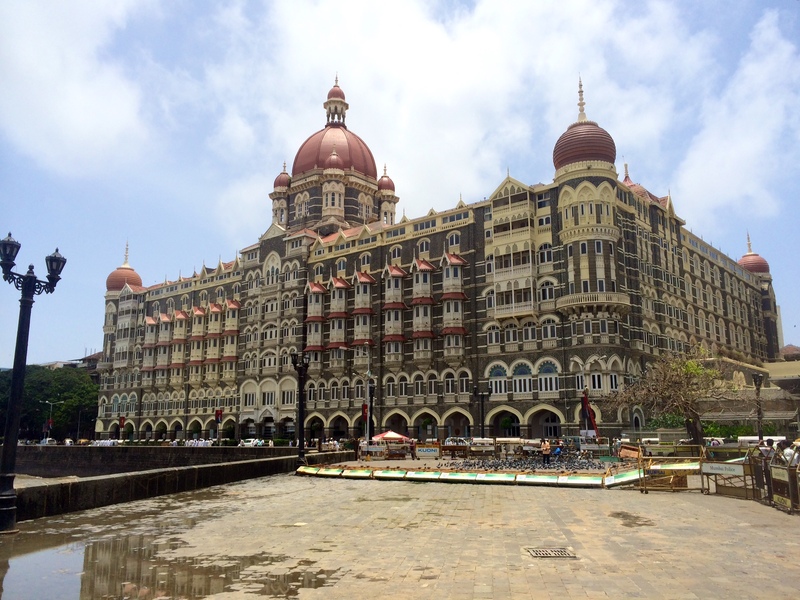 At 9, I walked over to the Salvation Army Guest House which is located directly across the street from the Taj Mahal Palace Hotel, India’s fanciest hotel. While a room at the Taj costs 30,000 rupees, a room at Salvation Army costs just 350 rupees including breakfast (about 1% of the price for the same location). The “Salvy” was a Mumbai institution and most likely the most famous hostel in India just as the Taj was the most famous hotel in India. While the hostel was dingy, I met some interesting people. My bunkmate the first night was telling me about his yearlong trip around Africa. He and some buddies bought a car in London and drove it to Tunisia, all the way down the east coast of Africa to Cape Town then up the west coast to Morocco. The journey totaled 33,000 miles and he visited 33 of the 55 African countries. The biggest lesson I have been learning about traveling to exotic places is that the people and the government are separate entities. The quality of the government has little to do with the quality of the people. This guy said that Sudan had the most welcoming people of any country he visited in Africa. Not at all what I expected. I have heard multiple times from many experienced travelers (including Americans) that Iran has the nicest people in the world. The next night, I met a man from Poland who hitchhiked from Alaska to Tierra del Fuego as part of a trip around the world. Coming from the same country as Pope John Paul II helped considerably. He came to India to write a book about his travels. Meeting people in hostels was one of my favorite parts of traveling. 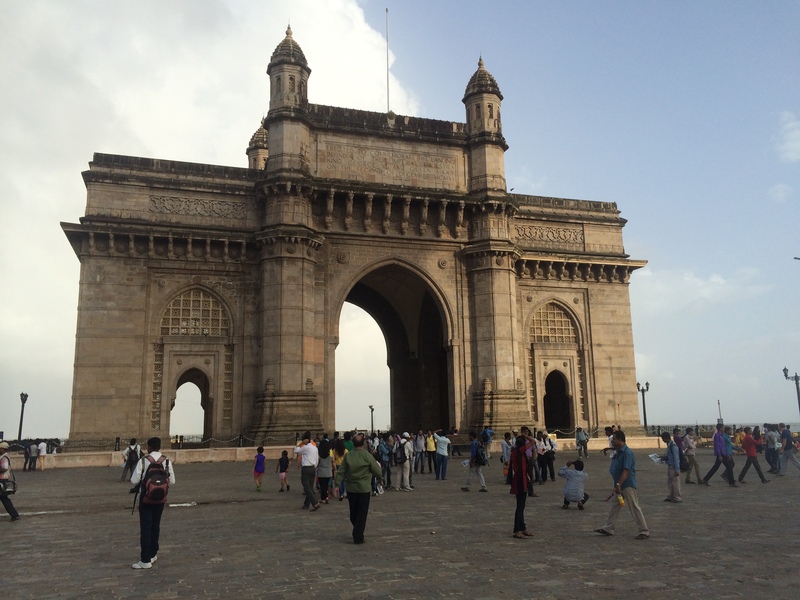 Over the next two days, I went to many of the major spots in Mumbai. I visited Gandhi’s house and learned in great detail about his amazing lifelong struggle for India and human rights. 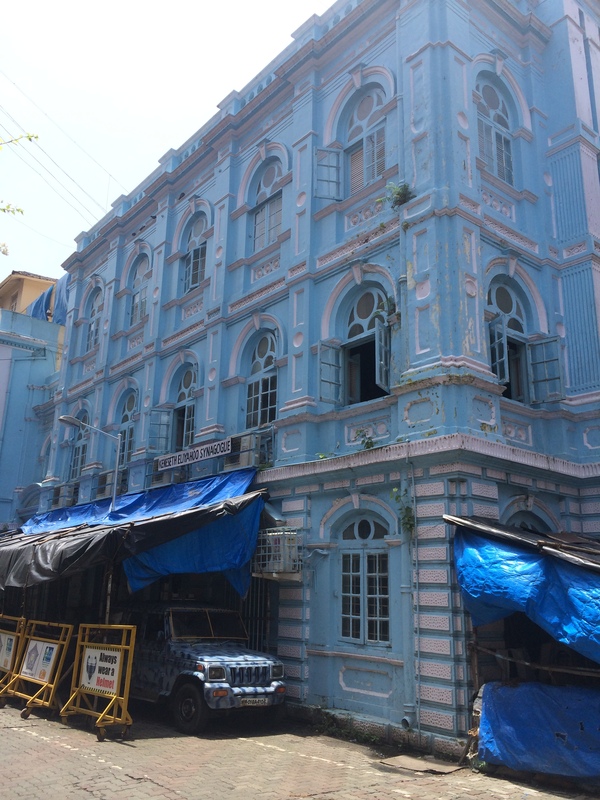 Jewish synagogue in Mumbai- the Jews have been in India for 2,000 years and have a unique culture. 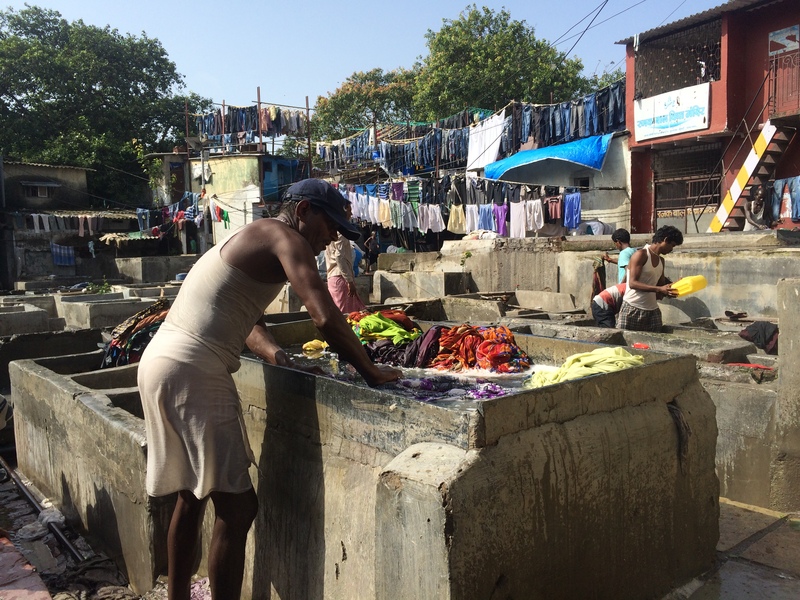 I visited the Dhobi Ghat, where all of Mumbai’s clothes get washed. Every laundry service in the city brings their clothes to this place where a staff of 5,000 wash clothes in open air concrete pits. I visited the Tower of Silence, a Zoroastrian cemetery. Instead of burying the dead, Zoroastrians leave the bodies at the top of this tower as food for thousands of birds. 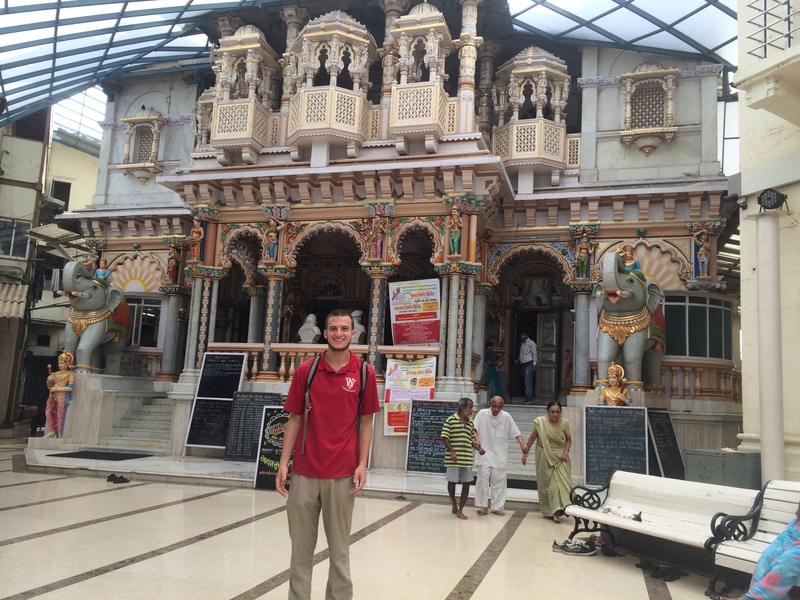 I visited a white marble Jain temple and learned about the religion dedicated to preserving all life. Jain Temple! In addition to being vegetarians, Jains don’t eat root vegetables because of burrowing insects that feed of them. I visited the Hanging Gardens, built on top of a large reservoir where the roots hang above the water. I saw the world’s most expensive house, Antilla. It was the height of a 60-story building and was owned by Ambani, the richest man in India. He, along with the Tata familiy seemed to own all of Mumbai. The land for the house was actually purchased from an orphanage for 1/5 of its value. There are over 600 employees at the house for the family of 4. 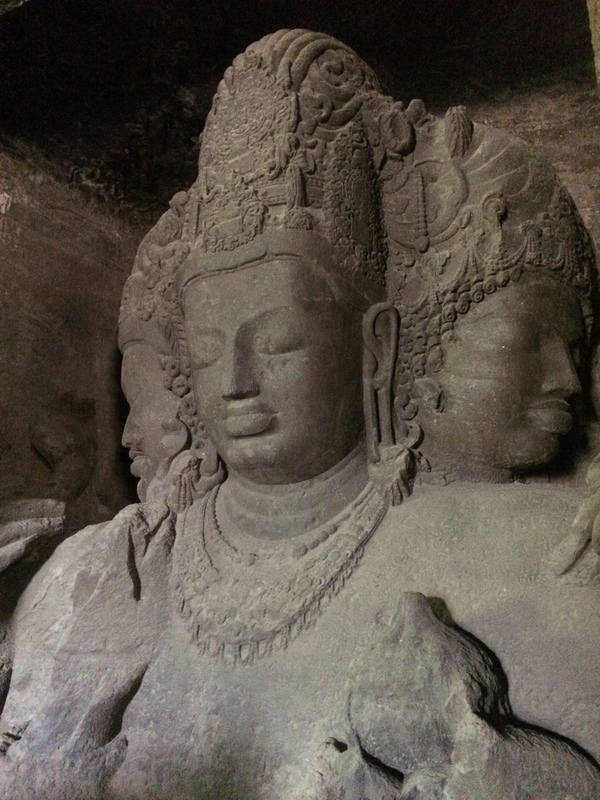 I visited Elephanta Island, a jungled island just 11 km away from the city center. The island has Hindu cave temples dating back to the 5th century and is a UNESCO World Heritage Site. The journey took 1 hour each way by a ferry from the Gateway of India. Normally, it closed during the monsoon due to stormy seas, but I lucked out and went on a sunny and calm day. I went to the Dharavi Slum, which is famous for being the largest slum in India. Somewhere between 300,000 and 1 million people live in Dharavi, which is famous for being featured prominently in the movie Slumdog Millionaire. While there were certainly many “slum postcard” moments such as the hanging toilet, it was not at all what I expected. There were lots of industries within the slum. I visited a huge recycling center where thousands of people sort plastics by hand then load them onto trucks to be reused by different industries. I also visited a place inhabited exclusively by potters from the state of Gujarat. While much of the slum is narrow winding corridors lined with trash, the slum had paved shopping streets in a grid pattern. Most of the houses in the slum had electricity and many had cable TV. There were also well-kept temples and mosques in the slum. Interestingly, nobody asked me for money while I walked through the slum, although one person offered to buy me tea. Walking around, I felt that slum had many connotations that were simply incorrect. Finally, I visited Marine Drive, which is lined with most of India’s skyscrapers. All the buildings, restaurants and shops were heavily guarded. I had to go through a metal detector and a pat down search just to go to Starbucks. The security was there for 2 reasons. The first reason was the wealth disparity in Mumbai. There were very rich and very poor with nothing in between. The second reason was because of the terrorist attacks that killed 300 back in 2008. Despite all these amazing sights, Mumbai (along with Pondicherry) was probably my least favorite Indian city: the prices were outrageously expensive (about 60-70% of US prices), the street touts were the worst, and it fairly touristy but what really got to me was the difference in wealth between the rich and poor. There were really 2 Mumbais. The first was the uber-rich who live in the many highrises scattered throughout Mumbai. They drove around in their air-conditioned cars and were protected from the world by metal detectors, high gates, and security guards. They had no problem spending 2,000 rupees to go to a club or 300 rupees for a cup of coffee. Then there were the super poor who lived in the slum by the train station or on the sidewalk in front of the Taj Mahal Palace. They worked long hours and begged just to make 5 extra rupees. These two India existed side by side on the same street corner. While the poor keep searching for just enough to live, the rich spent 1000 times that to creating new ways to distance themselves from reality. 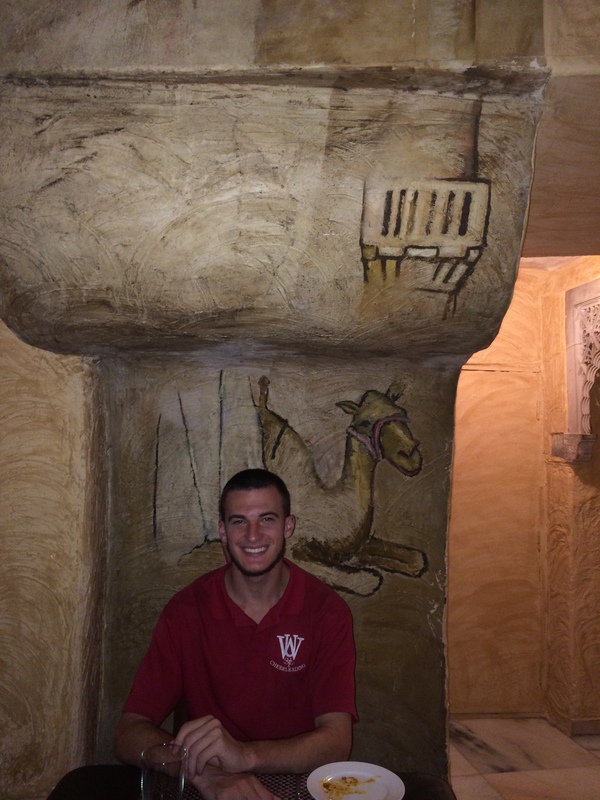 Khyber, an “Afghan cave” themed restaurant. It has been around for over 60 years and is one of the fanciest restaurants in the city. That said, I thought that the street food for 1/8 the price was better. The other thing that annoyed me about Mumbai was its strange relationship with its British legacy. Most of major institutions and famous buildings in the city owes its existence to the British: the Mumbai Stock Exchange, Chhatrapati Shivaji Terminus, Chhatrapati Shivaji Museum, the laundry place, Marine Drive, University of Mumbai (which educated the entire Tata family), and the Mumbai High Court. In 1996, the Indian government decided to rename everything British in the country to claim it as its own. That said, everybody still calls these institutions by their British names. No matter what it is called, Chhatrapati Shivaji Terminus will forever be topped with the statue of Queen Victoria. Rather than rename old institutions, Mumbai should try to carve out its own legacy as the capital of the New India.